Ira Sadoff's new volume of poems opens with a quotation from Rilke: "But because truly being here is so much; because everything here / apparently needs us, the fleeting world, which in some strange way / keeps calling us...." The poetry collected here is a response to this call. Rooted firmly in the "fleeting world," Sadoff's poems delve deeply into the personal as well as global past. The work dramatizes the power of culture to interject itself, creating fissure between our inner and outer lives. 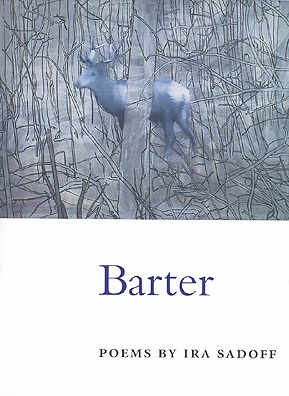 The poems wrestle with the pressures of commerce, the trading of bodies, the way we as a nation "use," exchange and bargain to evade the urgency of our time on earth. In "Self-Portrait with a Critic," Sadoff makes a succinct statement of purpose: "And inside, let's not make it pretty, / let's save the off-rhyme and onomatopoeia/ for the concert hall, let's go to the wormy place / where the problematic stirs inside his head." Poet, fiction writer, critic, Ira Sadoff is Dana Professor of Poetry at Colby College, and the author of numerous books, most recently Grazing(1998). He is the recipient of the American Poetry Review's Jerome Shestack Prize, Poetry Society of America's George Bogin Memorial Award, the John Simon Guggenheim fellowship in Poetry and a Creative Arts Fellowship from the NEA.